How to find : From the shop/Post Office follow the only road on Gigha north for 3.5km, and the stone will be seen just beside the road. 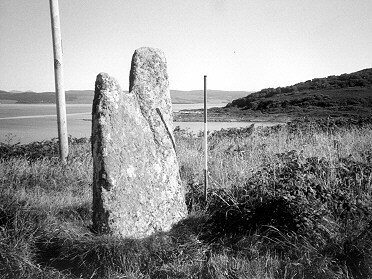 The stone is also referred to as 'Tarbert, Gigha'. Best time of year to visit : Any clear night. This is likely to be a Neolithic or Bronze age stone, despite its local association with the Iron age priesthood. The slab is over 2 metres tall, by about a metre wide and 40cm thick. It now leans badly to the east. The stone was surveyed as if it were standing vertically. The resulting bearings were, to the north - 9.9°, and to the south - 189.9°. With the horizon value to the north of 1.3° we obtain a declination of +34.6°. To the south, the horizon is 1.1° and the resulting declination value is -33.0°. Neither of these lines fits for any position of the sun or moon in the sky. It may be then that the stone was put up as a crude indication of the meridian, of which there are other examples in Argyll. 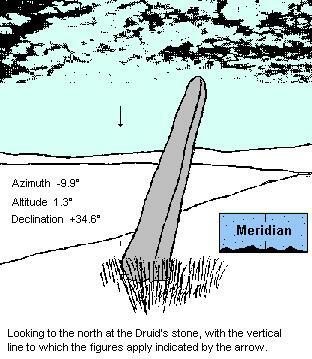 The meridian can be found by watching the movement of the northern circumpolar stars. (See Salachary and Carnasserie sites for full description). However, the stone has sagged to one side and may also have twisted in its socket. Only excavation of the socket of the stone could reveal whether the axis of the stone was set north-south or in some other direction originally.